Just three delicious ingredients and you've got these easy but fabulous Coconut Chocolate-Dipped Shortbread cookies! I like to cook and bake from scratch. But there are those times—we all know those times, right?—when you either don't have the time or the energy or the will to do it. For those times, it's good to have some ideas in your arsenal. Something fabulous but easy and totally delicious. Something you can make with really great pantry items, like great-quality shortbread, gorgeous chocolate, and crispy coconut. Luckily, all these ingredients arrived in my monthly Degustabox! If you follow Full Belly Sisters on Instagram, you'll see all the goodies I received via this monthly food subscription box. 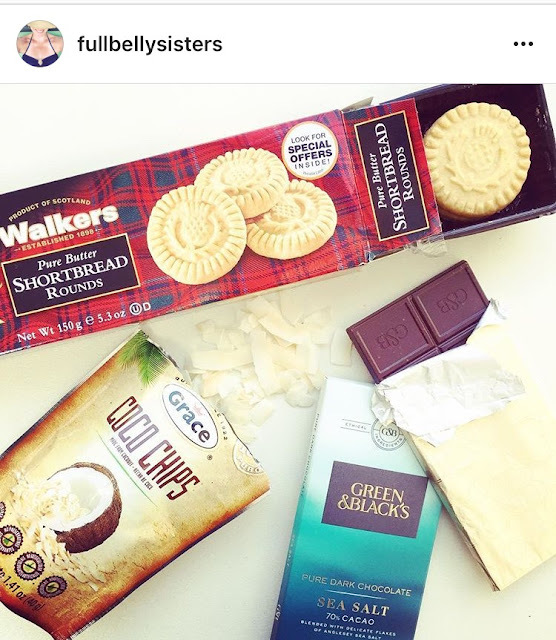 Three of them—Walker's Shortbread, Green & Black's Dark Chocolate with Sea Salt, and Grace Coco Chips—are perfect for this easy and delicious treat. 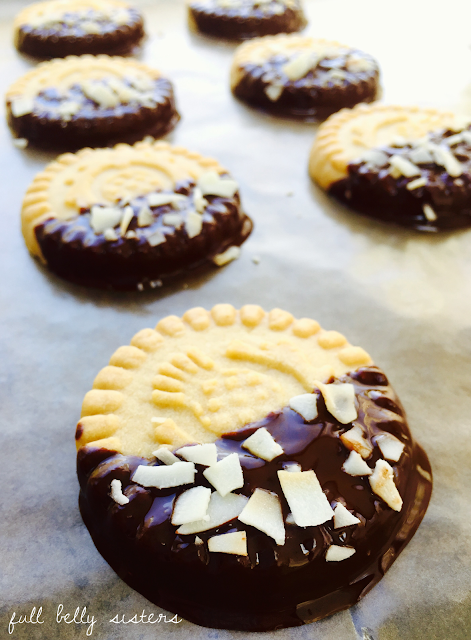 You can make these Coconut Chocolate-Dipped Shortbread cookies in just a few minutes. But they look fabulous and taste amazing! In a small microwavable bowl, microwave the chocolate uncovered for about 1 to 1 1/2 minutes, heating for just 30 seconds at a time so you don't risk burning it. Stir until smooth. Dip half of each cookie into the melted chocolate. Place on a cookie sheet covered in wax paper. Sprinkle crushed coconut chips over the melted chocolate. Leave cookies on the wax paper until the chocolate is set. I'm all for a little cheating, especially when it involves shortbread and chocolate! Last week I was running short on everything! I needed a dessert for a lady down the road. She gets a boxed meal from me every Friday. I had a chocolate bar and some graham crackers. I made something similar to this! She loved it's simplicity and "clean" taste. (not a lot of bells and whistles) Love this!